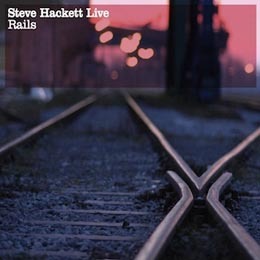 "Riding The Live Rail" - Live Rails, the latest live album by Steve Hackett reviewed by Alan Hewitt. Okay, so I am somewhat biased when it comes to Steve Hackett and live shows but hey, I couldn’t resist the temptation to review this latest offering of live Hackett so here goes. The first thing that you notice about this album is that it does not follow the trend which his previous live albums in the “Live Archive” series had created. This is not a “warts and all” recording more a “selection of shows” (where have I heard that before?). Either way, what you have here is another excellent slice of Mr Hackett in the context which suits him best - live performance. Don’t let the sleeve notes fool you though, I strongly suspect that this one was recorded a bit closer to home than Paris or New York but what the hell! I have always wondered exactly how Steve goes about deciding what material he and his band will play on each tour but this during 2009 and last year there was no doubt that the magnificent new album; Out Of The Tunnel’s Mouth would get a fair airing and indeed, it does with six out of the eight tracks appearing here - nine almost if you include the instrumental section from Last Train To Istanbul which heralds the band’s arrival on stage. The contrast between new tracks such as Emerald and Ash and established favourites such as Ace Of Wands only serves to show the sheer craftsmanship and dynamism of Steve’s writing and the undoubted talent of the musicians in the band. The new material fits seamlessly into the body of the set with the classics and new favourites are here in the process of becoming so. Anyone who has seen any of the shows that feature on this album, or indeed, the more recent ones will tell you that the band Steve has now is undoubtedly the best he has ever had - and he has always had belting players in his bands over the years. Essentially what you have here is another “best of Hackett” one which is equally enjoyable to anyone who was in attendance at any of these shows or to newer fans curious about what Steve sounds like in the live context. The answer to that one is bloody amazing as far as these admittedly biased ears are concerned - great stuff all round!